The sun was setting on our long journey but before returning home we wanted to see more of the north Pacific coast. Neither of us had been there in many years. Spike hoped to do a few more paintings. We traveled south on I-5 and soon experienced the worst 3 hours of the entire trip, Seattle-Tacoma area through Olympia in drenching rain, bumper to bumper stop-and-go traffic and the roughest stretch of road we'd seen yet- cracks, pot-holes, lumps and bumps. Not recommended for anyone towing a trailer. We were so happy to escape that urban mess at last, we stopped for the night at the first rest-area we saw. 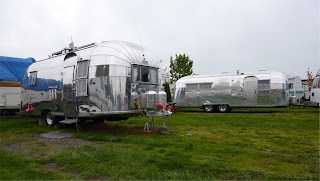 Following the recommendation of another vintage Airstream traveler, Polly Pulver, we headed for Cape Disappointment on the mouth of the Columbia River where Lewis & Clark first reached the Pacific on their long expedition. 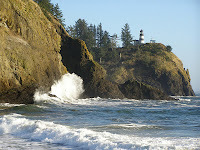 This is at the very southwest corner of the state of Washington. We could see Oregon across the river. The Cape Disappointment lighthouse and Lewis & Clark Interpretive Center are part of the Cape Disappointment State Park where we stayed for two nights. 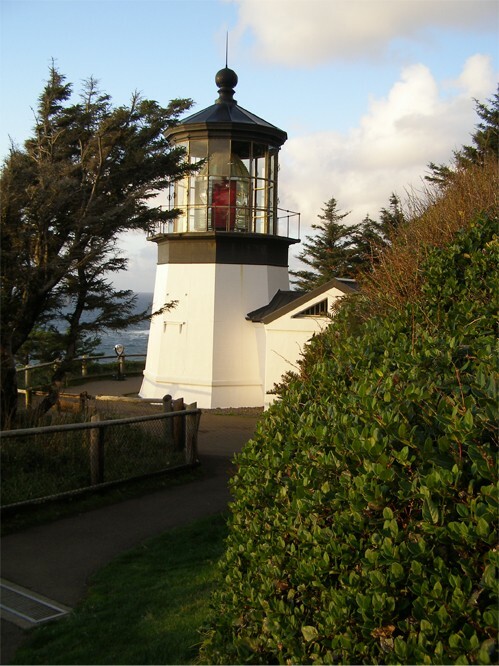 The Cape Disappointment campground was very large and well managed. We registered with a ranger sitting at a computer who assigned us a spot with water and electric for $27. Though not entirely full, the campground was busy. It was clamming season and the clam-diggers were out in force. It wasn't easy to smell fresh-dug clams cooking in campsites all around us while we opened yet another can of chili for dinner. 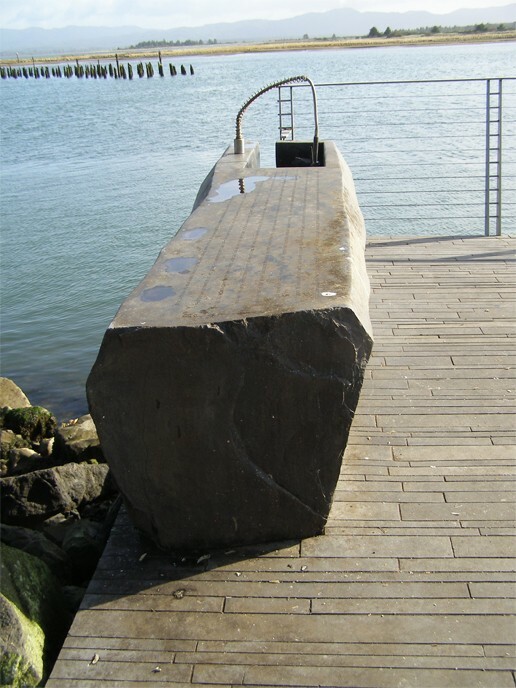 The Fish Cleaning Table, part of a public art project by Maya Lin called The Confluence Project. Maya Lin is the artist best known for designing the Vietnam Memorial in D.C. With the Confluence Project she is creating site-specific, permanent installations at seven locations along the historic 450 mile Columbia River Basin. 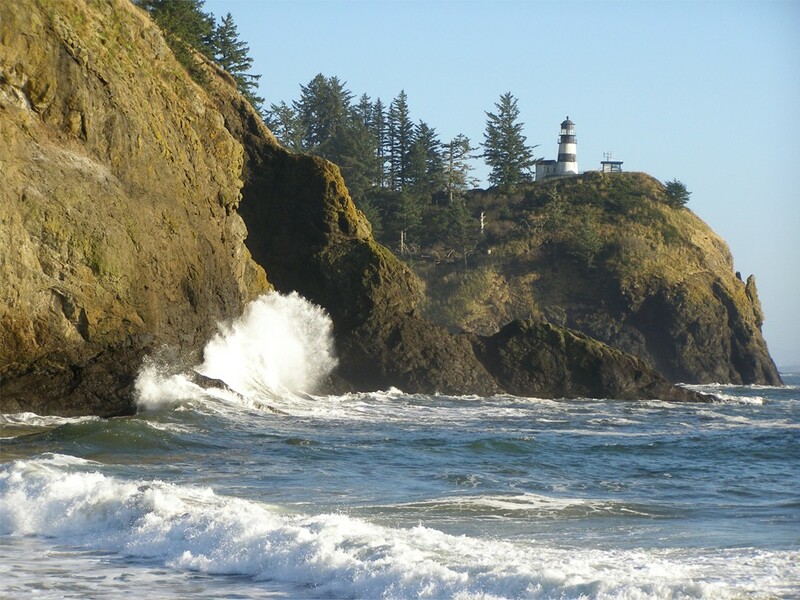 Of those we saw at Cape Disappointment, we found the Fish Cleaning Table most interesting and effective since it not only refers to the historic importance of the Chinook people in this region, but is also being put to practical use by present day residents for cleaning the day's catch. Formed out of columnar basalt, you can see in this photo the top is inscribed with the Chinook emergence story. The structure includes a deep sink with running water. We crossed the bridge into Astoria, Oregon. 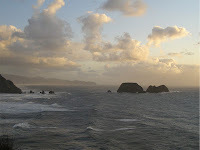 The north Oregon coast is dramatic with rocks and mist. 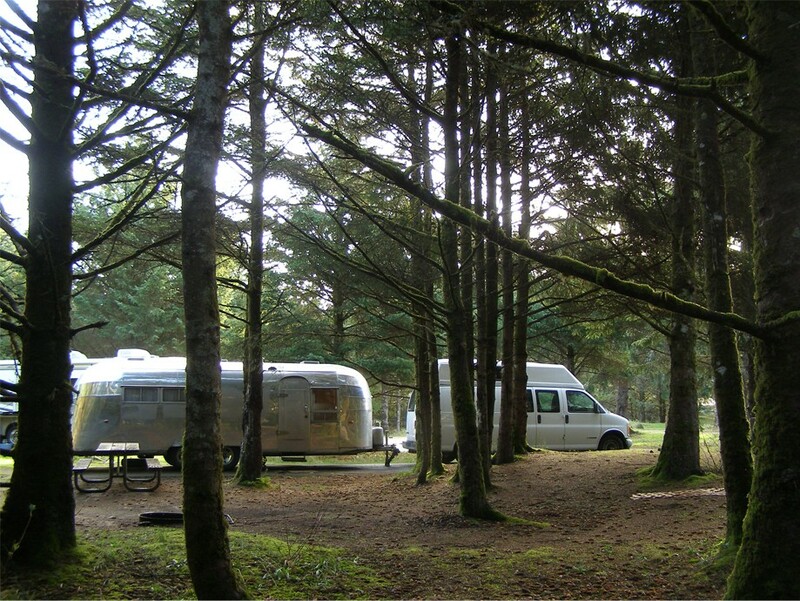 We found another really nice campground at Nehalem Bay State Park. Here we paid $20 for water and electric in a spacious and very empty campground. Empty of humans, that is. We had white-tail deer visitors who were curious enough to come within three feet of us as we sat in the sun while a large herd of elk grazed nearby. We took advantage of a sunny day to explore up and down the coast, looking at crashing waves, big rocks, cliff sides and lighthouses. It was time to head eastward towards home. We cut across the state of Oregon, aiming for the SE corner where we intended to enter northern Nevada via route 140. This was not to be. 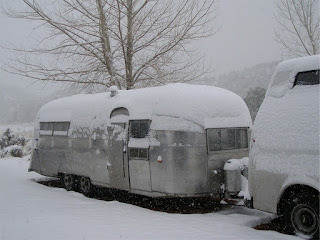 Near dusk we encountered a snow storm that worsened until the roads were slick with snow. 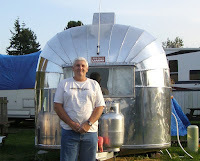 We passed up our turn off and crept into Lakeview, Oregon where, with much relief, we found an open RV park. Safely parked and hooked to electricity, we were prepared to sit out the storm as long as it took. With luck, the next morning was clear. We continued south, cutting through the corner of California into Nevada. 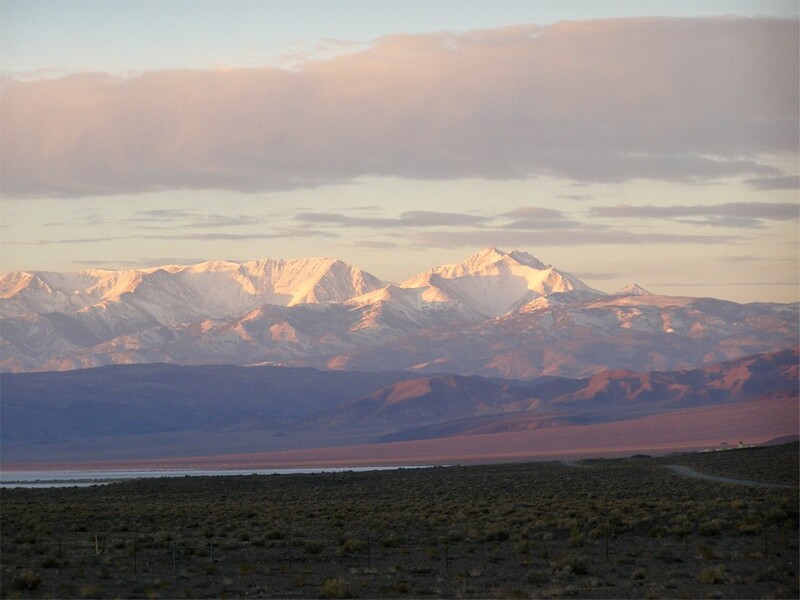 We decided to go as far south as possible to avoid high mountain passes. The forecast was for snow all over the northern part of the state. The coldest night of the entire 10 week trip was our last night on the road spent boondocking at a rest stop in Luning, Nevada. It was 17 degrees when we got up. 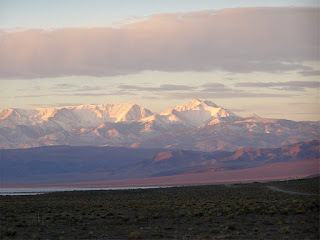 We quickly made coffee and got back on the road towards home in time to see this a beautiful November sunrise looking west across the desert at the snow covered Wassuk Range. We arrived home November 4th. It snowed the night before. 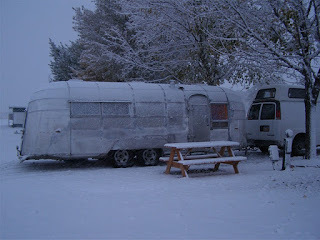 We had one clear, sunny day to unload and winterize before a storm arrived November 6th and left 8” of fresh snow. Nevertheless, we were glad to be home. This is what we found: road conditions are fine if you take it easy and drive smart. After winter’s wear and tear, road repairs take place in the warmer months. 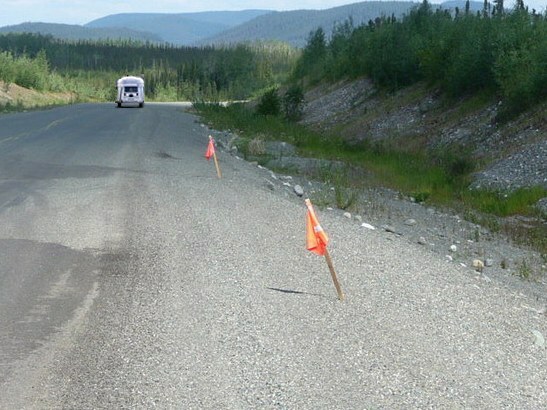 By autumn there were still patches of gravel to beware of as well as areas with dreadful frost-heaves (especially in the Yukon along the boundary of Kluane National Park.) We learned to watch for small, red warning flags along the roadside marking pot-holes or other road damage. 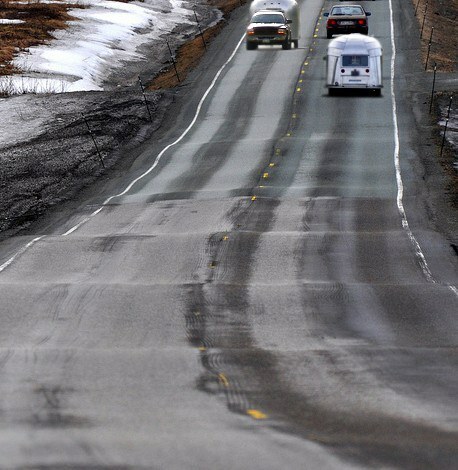 With trailer in tow you sometimes had to slow down to 35–40 mph. Don’t be in a hurry and stay alert for wildlife. We had no problem with availability of gas as long as we paid attention to the gas gauge and distance between towns. 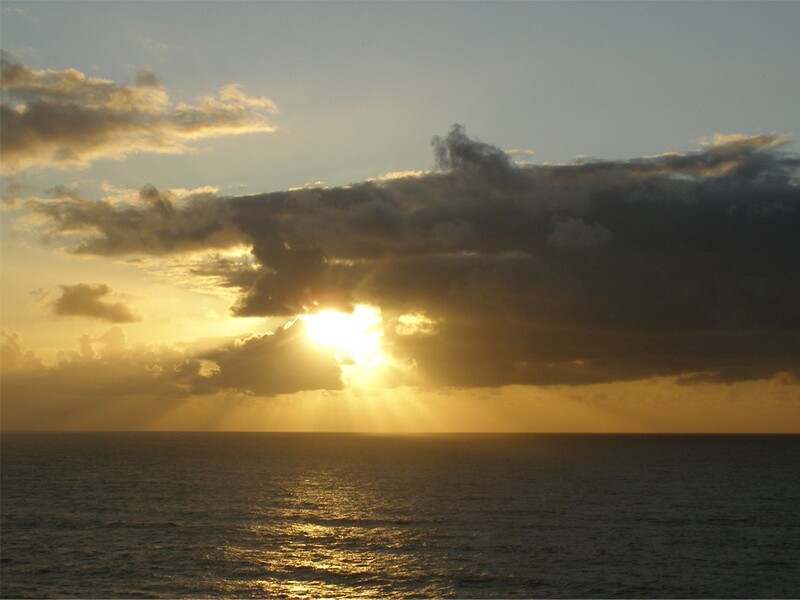 The Milepost guide is extremely helpful with information on availability of services but not always correct (as editions are updated yearly, use the most recent edition.) Carry extra gas and top-off at ½ a tank or less. Since we live and travel a lot in the southwest, great distance between gas stations was not a new concept for us. Gas is very expensive in Canada (as is booze!) prices are somewhat lower in Alaska but food prices are high everywhere up north, especially in more remote areas. We resigned ourselves to paying $7 for a gallon of milk or $5 for a bag of tortilla chips. A favorite staple became giant Idaho baking potatoes, at close to 1lb each, they were a meal in themselves. We never see those here in southern Utah. 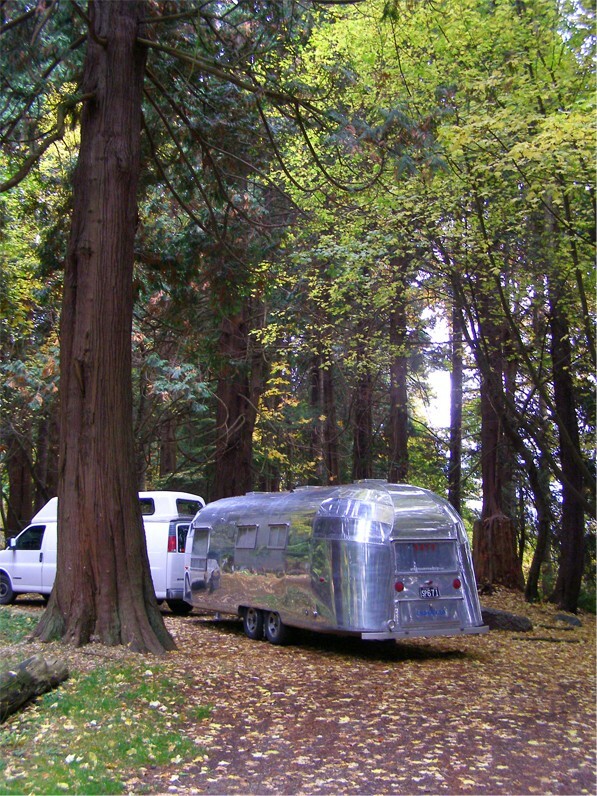 Many public and private campgrounds close up for the season mid to late September. 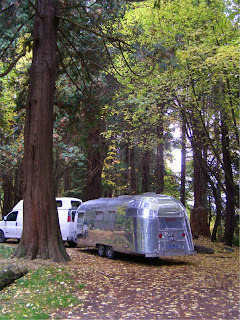 This made finding campsites difficult as we continued to travel in October. Again, the Milepost guide was very helpful to locate not only campgrounds but also roadside pull-outs and rest areas. 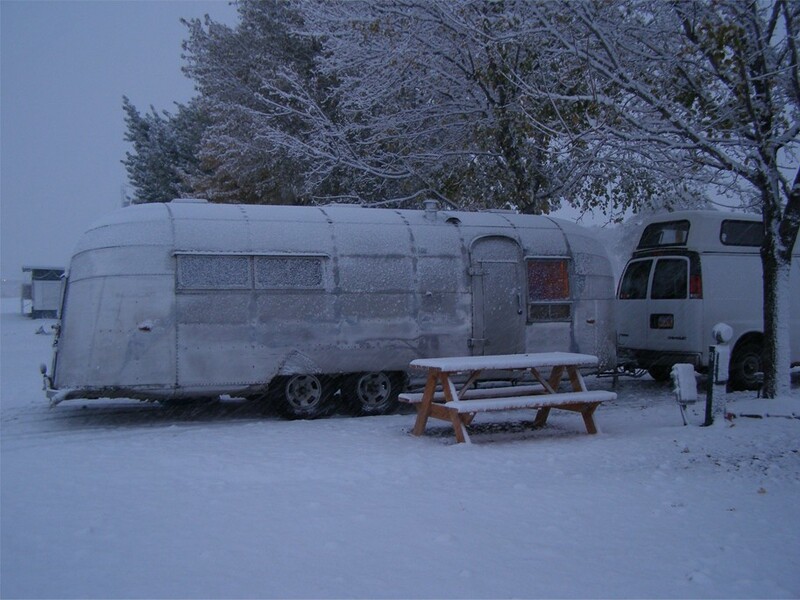 We also relied on local visitor centers for camping and dump station information. We grabbed all the helpful, free tourist literature we could. Some of these publications can be acquired on-line ahead of time. Pre-planning is helpful but winging it is fun too. 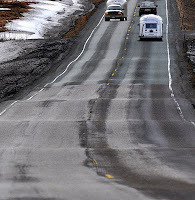 Driving the Alaska Highway, as well as all the other routes we traveled is no longer the rugged, daring adventure it once was, but it’s a wonderful adventure nonetheless. 2nd in Faibanks 10' from gas pump, put gas in from can, pulled forward & filled the tank, LOL! Alaska scored the most with 14, Washington second with 10, in use 25, in storage 41. Mammals: black bears, brown bears (grizzlies), caribou, rock sheep, Dall sheep, bison, moose, muskox, elk, mule deer, white-tailed deer, mink, red fox, muskrats, steller sea lion, harbor seals, sea otters, red squirrels, coyotes. Birds: bald eagles, gray jays, black-capped chickadees, varied thrush, sandhill cranes, harlequin ducks, trumpeter swans, brant geese, red-breasted mergansers, common mergansers, common loons, Barrow's golden-eyes, spruce grouse, spotted owl, American pipits, nuthatches, winter wren, and many others less significant or unidentified. Mosquitoes: NONE! We were there in September & October. Best things we took with us: Big Heat electric space heater, 12 volt fan, Italiano stove-top espresso pot, The Milepost Alaska Travel Planner. Things we brought that we didn't need: dress-up clothes, pop-up shade canopy. If you have any specific questions we haven’t addressed here, please leave a comment below and we will do our best to give an answer. Back in 2010 as we began restoration on Moonshadow, our 1955 Airstream Overlander, we spent many hours researching on-line at the Air Forums and Airstream blogs by others who have done restorations, some experts and some amateurs like us. We became familiar with certain bloggers through reading posts and communicating on-line. Over time we've met a few in person and hope to meet more. 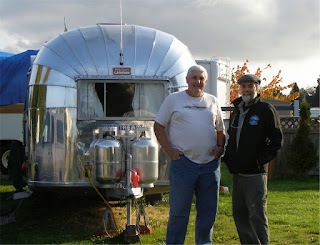 As plans for our Alaska trip developed we routed our return through Washington state in order to visit friends in the area and to meet one of these Airstream bloggers, Steve, whose work on his 22 ft. Caravanner, Island Girl, is inspirational, as is his story of over 20 years living on a 31 ft. sailboat with wife Pam. 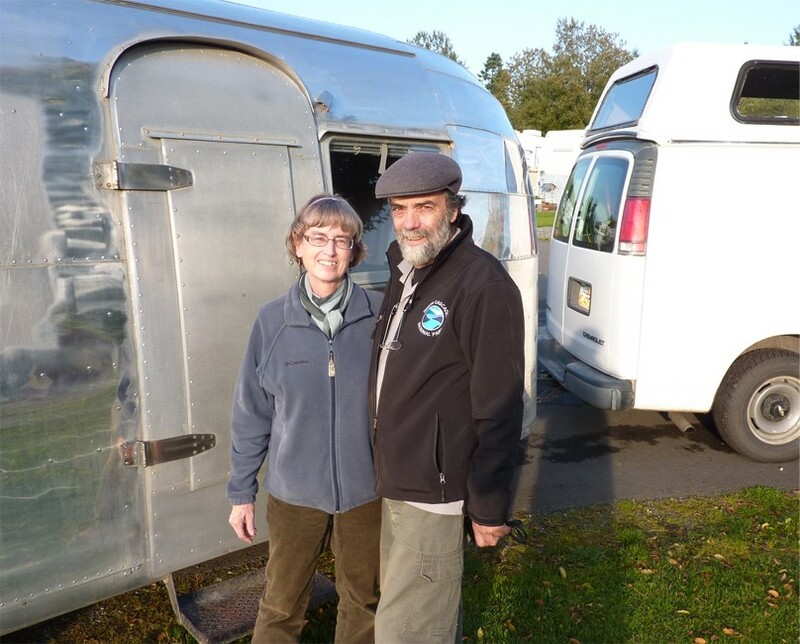 From 1996 to 2004 Steve and Pam circumnavigated the globe, wandering the world, having great adventures until Pam began to show signs of Alzheimer's disease. She did not want to give up their sailing life so they stayed on the boat but headed homeward. They continued to live on the boat at a marina in Blaine, Washington. Steve became Pam's full time caregiver. To keep himself busy he bought a 1957 Airstream Caravanner and dove into the restoration. In August of 2011 Steve, Pam and cat, Brissy, gave up their beloved boat to move into Island Girl as Airstream full-timers. It was at the RV park where they now live that we met them in the last week of October. 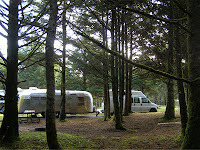 Steve recommended Birch Bay State Park as a good, nearby campground. We arrived around 2:00 PM. It was one of those seaside parks so thick with trees you can't see the water. We paid $21 for a space with no hook-ups. Though electricity and water were available we didn't feel we needed it for one night's stay. Leaving a folding chair to mark our site as taken, we headed for town, trailer in tow. We wanted Moonshadow to meet Island Girl. Island Girl and Moonshadow, side by side. Don't they look great together? Steve turned out to be the nicest guy. Of course, talking Airstream is a source of great pleasure for him during a difficult stage of his life. The day of our visit a home care helper was there to care for Pam, giving Steve some free time. Brissy, the exotic cat from Brisbane, Australia, adopted while Steve and Pam were on their world travels. Until now, Brissy had only ever known life on the boat. 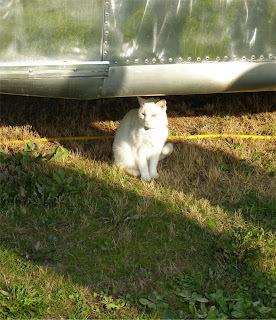 Now she adapts to the Airstream and terra firma. After over 20 years on a sailboat, Steve said he still feels a need to be anchored. Steve gave us the tour, inside and out. 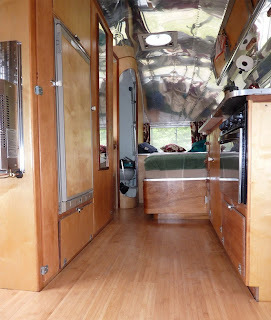 Here you can see the beautiful job he did with bamboo flooring, rebuilt cabinets and other interior details of his own design. 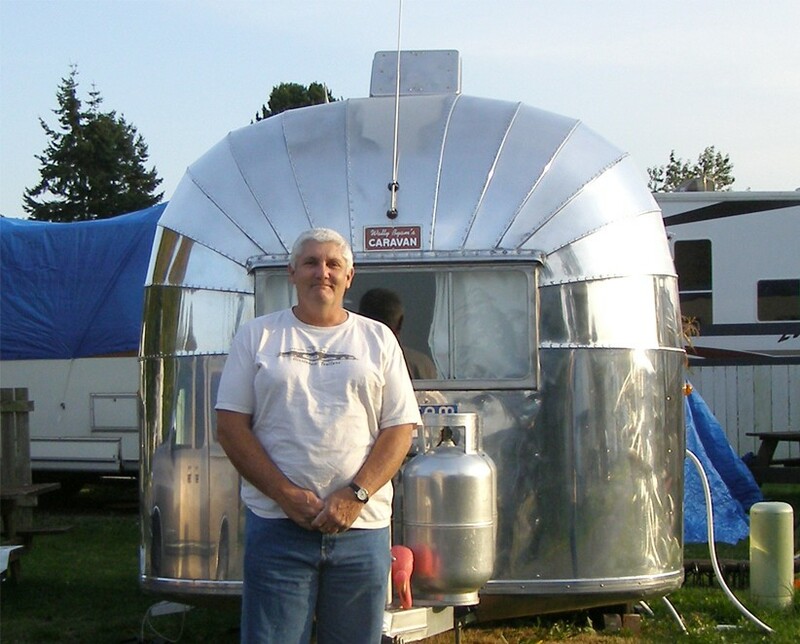 Steve told us that in 1957 Airstream started using molded plastic on the front interior, which he didn't care for. 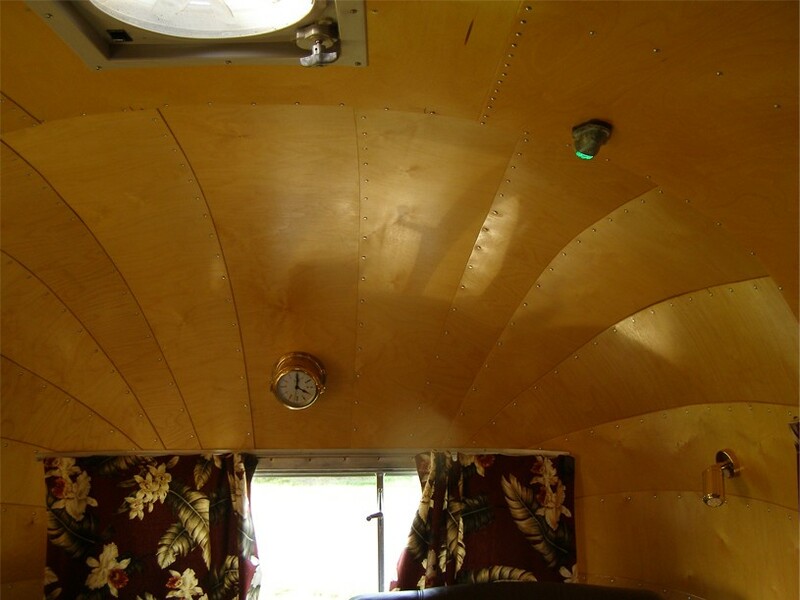 In order to get that vintage, 13 panel look, Steve covered the plastic with wood veneer to create a beautiful finish much like the interior of a boat. To further the boat theme, notice the green running light on the ceiling. 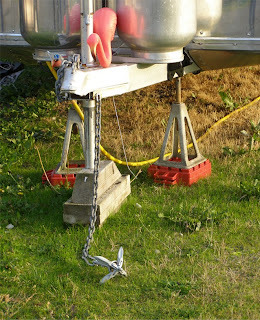 Steve replaced both the red and green running lights on his boat, keeping the orginals as tokens of good memories. He made creative use of them by mounting both on the ceiling of Island Girl above his and Pam's comfy recliners. The next morning we returned for a round of espresso, a bit more visiting, photo ops and goodbyes. In the chill of a light drizzle, Steve greeted us in short sleeves and bare feet. We were bundled up in fleece coats, scarves and hats. Steve laughed at us and said in Washington if the temperature is above 45 degrees, it feels like summer. 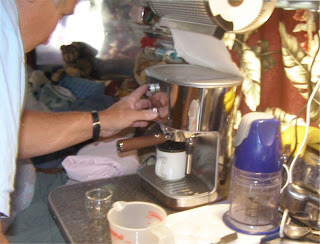 If you are a coffee lover, Steve makes the best cappuccinos ever. while Brissy went in and out, in and out. A montage video and tribute to our new friends, Steve, Pam, Brissy & Island Girl. Click arrow in center to play video. 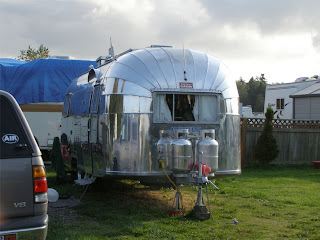 Our next post will wrap up the last leg of our trip and conclude with answers to the questions some followers have asked about details of travel to Alaska in an Airstream.